Here is some interesting background to how we move in Tai Chi. This should help the more enthusiastic students to learn. 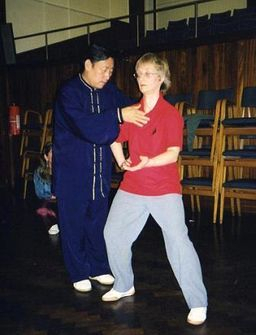 This knowledge is from the current head teachers and lineage holders of the Chen Style Tai Chi. If the mind is not clear, you lose the upper body. Both eyes look forward. The eyes follow the middle finger of the main hand movement, but don't turn the head to follow it. Teeth should be closed with the tongue touching the upper palate. This will create saliva,which will sink down to the dantain, helping to create internal energy. Both ears should "listen behind". This helps to sink the Qi to the dantian. The circulation makes the muscles relaxed and the hairs sensitive. a) Lifting the head too much causing the neck to stretch. b) Following the hand by turning the head. The body should be upright, the chest slightly in. Shoulders and elbows should be relaxed, breathing is natural. If the root is no good, the applications cannot work. The legs must differentiate between yin and yang. If the weight is mostly on that leg, then that is the yang leg. If there is less weight on that leg, then that is the yin leg. On the yang leg the knee must point in the same direction as the toes. On the yin leg the toes are turned in. Do not let the knee extend beyond the toes. Keep the knee open on the yin leg, do not let it collapse down. Release of the energy starts at the feet, knees, hips, waist and eventually moves out through the fist. The waist is the axis. If the weight is on the toes, you are leaning too far forward. If the weight is on the outside of the feet, you are off balance. Bend the knees and sink the hips. Strong legs are essential. If you cannot stand on one leg, you will have a problem with the weight distribution. If you do not have a good relationship with your teacher, you cannot develop your Tai Chi. If you are not a good student, your teacher will not waste time teaching you. Tai Chi knowledge is a very wide subject. The closer the teacher and the student are, the better understanding the teacher has, of just what that student needs. Outside of the class the teacher and the student should also be friends. A good teacher can direct you on the right path of understanding. hard. A teacher can show you the movements but it is up to you to practise and train in the movements. Only through your own practise can you develop good gong fu. If you train hard, you can eventually become a Master. In the West many teachers call themselves "Master" but they are not really at this level. Beginners start by just making movements. They do not understand the relaxation and cannot feel the Qi . This takes a long time. Qi is created through practise of the movements. It builds up slowly. Qi is first felt in the hands. When the body is relaxed Qi can go to the Dantian (beneath the navel). At first there is only a small amount of Qi in the dantian, but gradually this will build up. Learning Tai Chi has different levels just like going to school - primary, secondary, college, university. It takes about the same number of years! Good Tai Chi takes up to 10 years to develop. Tai Chi has 5 levels. Most people can progress through the first two levels. Level 3 is when the gong fu develops along with the Tai Chi feeling. The 5th level is like wind and water (feng shui). It can be very gentle or very powerful and can quickly change from one to the other. 5) Jui - attaining enlightenment. 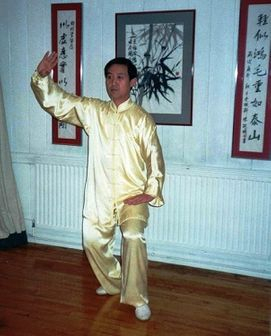 More about Grandmaster Chen Zhenglei on his own page, click the tab at the top. "More"
There are many Tai Chi movements, forms, weapons etc., but there is only one principle. If you can follow the principle all your movements can become correct. The hips must be level to support the dantian. The Tai Chi movements are all body changes from yang to yin. The Silk Reeling exercises teach this method. When the Silk Reeling is correct, you can correct all your postures.